Since we have lots and lots of videos here, you will need to know the best way of finding what you are looking for. Each post has the video(s) of the topic it is about. Many times there will be more than one video that is a continuation of the previous one. These videos will be posted together within the same post. To find what you are looking for, either use the search box or the list of categories posted in the right column. The IQ system is constantly evolving, so please keep in mind that some of the older videos may show features that have been replaced by newer ones. This is a video by Sonya Chinn demonstrating how she used line pattern with an offset to quilt a specific distance from a seam line. If you prefer to watch it on youtube because the whole screen isn't visible here, this is the link. The motors in this video are the older kind with gears rather than drive belts, but adjusting them is exactly the same, so ignore the gears, if you don't have them, and pay attention to the screws being adjusted by Jim Higginbotham. This can be a time consuming job, but you will be able to do it. Don't be tempted to loosen the screws more than a quarter turn at a time - do the adjustment just as Jim shows, checking the height after each adjustment. When you have the motors adjusted, you must calibrate iQ, and run the drift test just to make sure everything is correct. This video by Heather Buchwitz is an overview of using echo pattern, no sew block and clipping blocks to create an echo and background fill. Heather realized that the extra jump stitches that puzzled her in the video were there because she left jump stitch as the transition when she added the background fill panto to the block. Changing that transition to continuous would have eliminated those jump stitches. 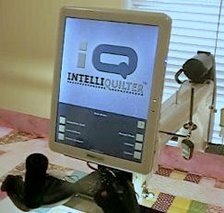 Click to register for the Computerized Quilting forum.